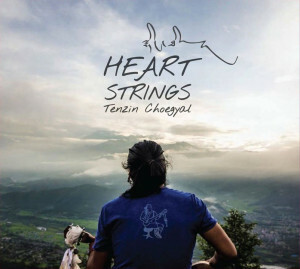 Heart Strings is a biography through song, reflecting Tenzin Choegyal’s musical influences and collaborations across the continents. From songs recorded with children from the Tibetan Children’s Village where he grew up, to sophisticated arrangements with Western Classical String Ensemble and masters of Indian classical music, with Heart Strings Tenzin breaks new ground while keeping his Tibetan roots. Heart Strings is available through Perfect Potion stores and online at EthnoSuperLounge. I have also made a small film clip to accompany the title song ‘Heart Strings’ which features Tibetan children in exile. Heart Strings in Tibetan is ‘Nying Thik’ which means Lineage Holders. I’m sure you will agree with me that children are the future stars of our planet. I would like to thank you for purchasing this album and I hope you enjoy it. Please note that track 11 is 40 seconds of silence followed by track 12 which is my version of the Tibetan national anthem. I have included those two tracks to honour the Tibetans who have passed away in their struggle for Tibet. Those two tracks are not listed on the track listing. Many thanks to Perfect Potion for making this CD possible. May you know all the lights as your own light.